“You’d never think it would happen to you. You’d never think that one day you’d stand in a graveyard, rain tapping on a sea of black umbrellas, watching your parents being lowered into the earth, never to come back. Sarah Midnight has dreams, dreams she writes down so her parents can search for the demons from them. The demons which are roaming the Earth having slipped through from the place they were banished to years before we can even remember. But one day her parents are found dead, Sarah has been sheltered from the full extent of the Midnight legacy but she knows that she can’t let anyone discover who her family were and she can’t leave the family home. When her Aunt Juliet tries to get her to move out Sarah grasps at anything she can to stay. Then Harry turns up, he’s a Midnight too, a cousin she didn’t know she had, and he’s there to help her understand what’s going on and why there are demons after her. But he can’t share everything with her and sometimes she feels like she’s stuck in the web of secrets her parents spun her. Wow. I’d heard good things about Daniela Sacerdoti’s writing but I hadn’t imagined it beng this good! Dreams was incredibly climatic with amazing writing and intriguing characters, a combination that had me begging for each turn of the page! The plot for Dreams was really interesting. I’ve only really read one ‘demon’ book before (Forsaken by Jana Oliver) but it was different to this. This was very well set out with families and their heirs having powers and the ancestry of those powers going back hundreds of years. It was really interesting that you got more than just Sarahs story too, with snippets of other hers and the war that was going on around the world of the secret families. Dreams did nothing for my trust issues though… I find it hard to trust people – and especially characters in books! – I think they are all hiding something or are up to something and even the good guys in this book seemed to be hiding something (this isn’t a spoiler, most of the ‘secrets’ are revealed to the reader early on!). I didn’t trust any of them and only trusted Sarah because she was the narrator, which sounds stupid come to think of it! However I did really enjoy reading the characters. Sean was probably my favourite character followed by Elodie and Niall. Sarah was a nice enough character but I didn’t warm to her that much, however I don’t think that’s her fault as I didn’t like how little she knew – which is really down to her parents! Saying that though I loved the relationship that was built up between Sean and Sarah, it was a nice progression but I do think she trusted him too quickly, letting someone who claims what he does into your house an hour from first speaking to them and letting them stay there with you alone probably isn’t a good idea! I was willing for a turn of events that allowed Sean and Sarah to act on what they felt for each other but it was difficult and I can’t wait to see where the next book goes with their relationship. Some of the things that happened in the book were incredible but I needed more of an explanation for them. I want to know how the ‘war’ between Humans and Demons started, which we catch a glimpse of in this book but I have a feeling there is more. I also want to know how Sean can do that thing he does *cryptic* and who Leaf is. Leaf is an interesting character but there’s something not right about him, he kinda makes my skin crawl and I can’t see why Sarah would let him so willingly into her life… but then again, I love Sean and she does the same for him I guess. Dreams is a fantastic YA paranormal with a lot of movement to become one of the best paranormal series I’ve read. I wait with baited breath for the second book. 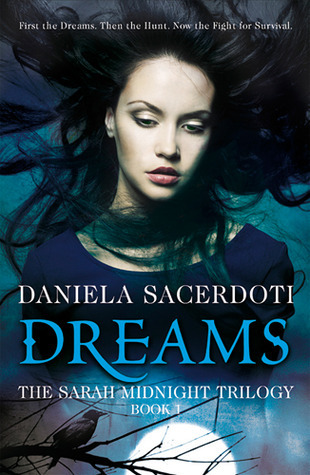 Dreams is the first book in the Sarah Midnight Trilogy, it was published on May 17th by Black and White Publishing. Thank you to the publisher for sending a copy in exchange for an honest review. I told you Dani was good!!! !